Haircuts for children with Autism, MN | Kids' Hair Inc.
Kids’ Hair is a proud partner of Fraser and is dedicated to making the haircut experience for all children including those with autism or sensory issues a fun, safe and comfortable one. Fraser is Minnesota’s largest and most experienced provider of autism services. Fraser provides services for mental health and other developmental disabilities for children and adults with special needs through healthcare, education and housing. All Kids’ Hair stylists have been trained by Fraser on making the haircut experience comfortable, safe and fun for children with autism. They have also gone through our Kids’ Hair Inc training program that extensively covers the comfort and safety of cutting children’s hair. Kid-friendly movies playing at each station. Every station has its own TV so if the extra noise and distraction from the TV is not wanted, we can always turn them on. Small toys, or “fidgets,” for kids to play with while they get their haircut. Child-sized chairs with safety belts (we also have adult chairs). Each salon has a simple, one page Visual Cue sheet to help guide children through the steps of a haircut. We do not perform any chemical services in our salons. Our stylists use equipment that is made for children and designed with safety features. 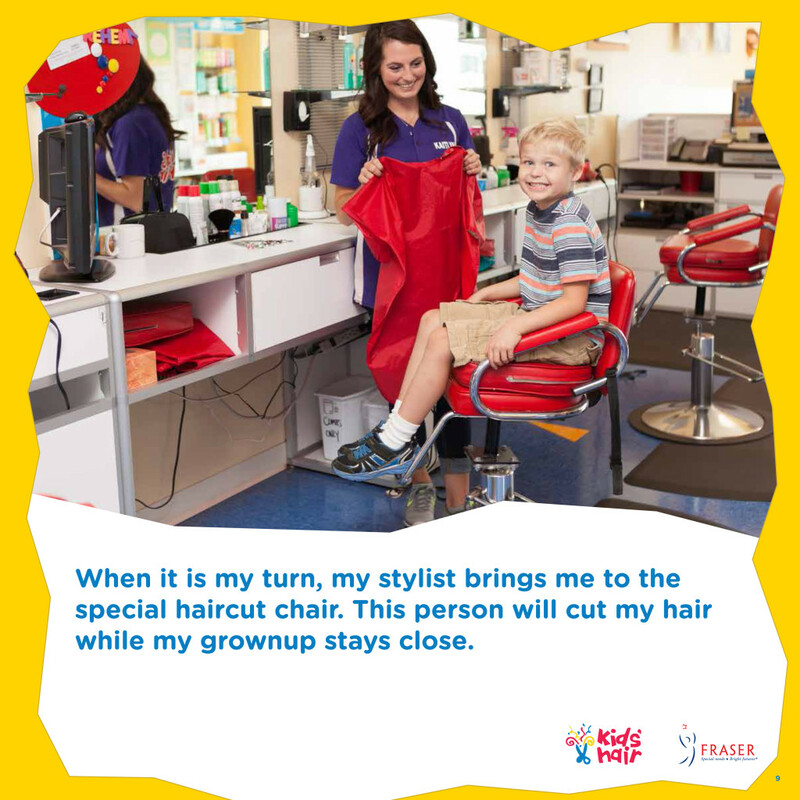 With Fraser, we have created our very own Kids’ Hair social story, “I am going to Kids’ Hair to get a haircut.” You can read through the social story here before you come or read through it at all our locations, we have a small, hard-copy booklet at every salon.